Wow, Munich. We had a blast with you!!! We had a lot of fun and are looking forward to coming and visiting you again. METAL UP YOUR LIFE 4 on November 25th, 2017. 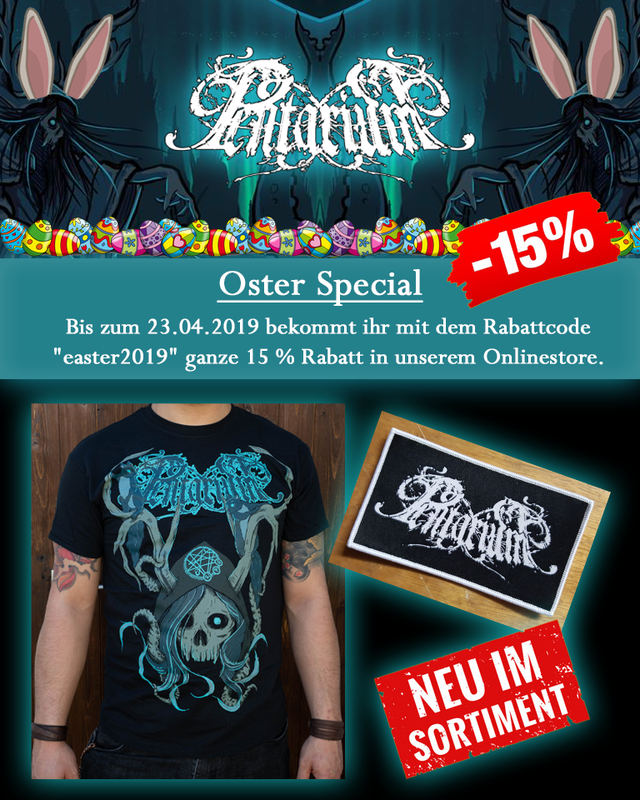 Chaedrist, Mornir, Sweeping Death and the hosts – Entoria – are playing with us. We’re looking forward to a great evening! Thanks to Mountain Range Creative Factory we proudly present to you our new homepage. They really did an awesome job on this. From September onwards, we’ll be playing a number of concerts. The next one is on September 9th, 2017. We are more than happy to play the B.E.A.S.T. 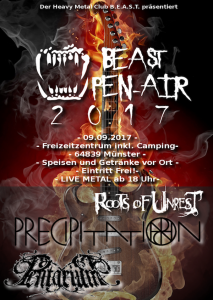 Open Air in Münster/Dieburg with our friends Precipitation and Roots Of Unrest. Come in masses, entrance is free. P.S. We’ll have new songs for you. On December 1st, 2016, Pentarium turned 10 years old. For this occasion we decided to do something special. Because our older material only exists in more or less moderate quality, we will re-record a few old songs in a renewed version. We will also add in a few unreleased songs. We will also adjust our live set so you can listen to some of the new stuff. -The lyrics for the unreleased songs or fragments which we’ve composed in the past will be in German. They will be different to the usual Schwarzmaler material. P.S. Those of you who read through all of this get a new announcement as a reward: Schwarzmaler is getting a follow-up EP. It will be a concept EP with brand-new songs. In a few days it’ll finally be time for our album release and 2 shows. We are more than happy to announce that our guitar and bass strings are made by Pyramid Strings. 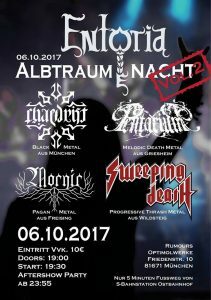 On September 9th, 2016, we will release Schwarzmaler and will play at METAL RODEO (Das Rind, Rüsselsheim) with 19Para, Escape The Demise & Fallen Temple. On September 10th, 2016, we invite all of you to come to Cafe Central in Weinheim to celebrate our album release, together with our friends of Precipitation and All Will Know. Al Goregrind from Frankfurt will be supporting us as well. besides our album release (which we’ve been excited about for months now), we were busy booking some more concerts. Here’s a short overview for what’s coming. More information on the shows will be released during the coming weeks. 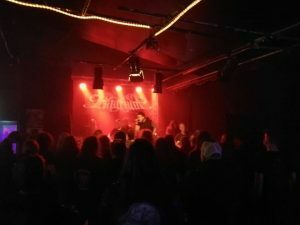 Despite the European soccer Championship being on at the same time, a few of you found their way to the Knabenschule to party with Last Asylum, Precipitation and us. Thank you very much for being there. On this occasion, we want to thank our guests “Precipitation” and our friends of “Last Asylum” for organizing everything with us. Save the date: September 23rd, 2016, we will be playing in Darmstadt at the Goldene Krone with Arkuum and Betrayal. Together with our friends of Last Asylum we have organized a concert in the Bessunger Knabenschule in Darmstadt. The melodic death metal band “Precipitation” will also appear on stage.